Method Teaming is based on research carried out within the business world beginning in 1990. This research was catalogued in a variety of streams but is now generally referred to under the umbrella term ‘Intellectual Diversity’. Intellectual Diversity starts with the proposition that everyone has a collection of natural talents and attributes. In Method Teaming this plurality of strengths goes by the singular moniker ‘Intellect’. Every person has an Intellect. The definition of someone’s Intellect can be called their ‘intellectual phone number’. Just like their phone number it is unique and speaks only about them. In order to determine someone’s Intellect there is a critical component of Method Teaming science called the Method Teaming Intellect Profile or MTIP. 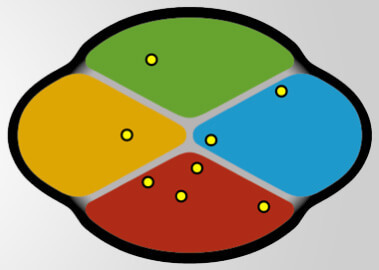 The MTIP is the core of Method Teaming. It is the integration of three Instruments (psychometric tests), each drawn from a separate body of science, that combine to perfectly triangulate each person’s Intellect. 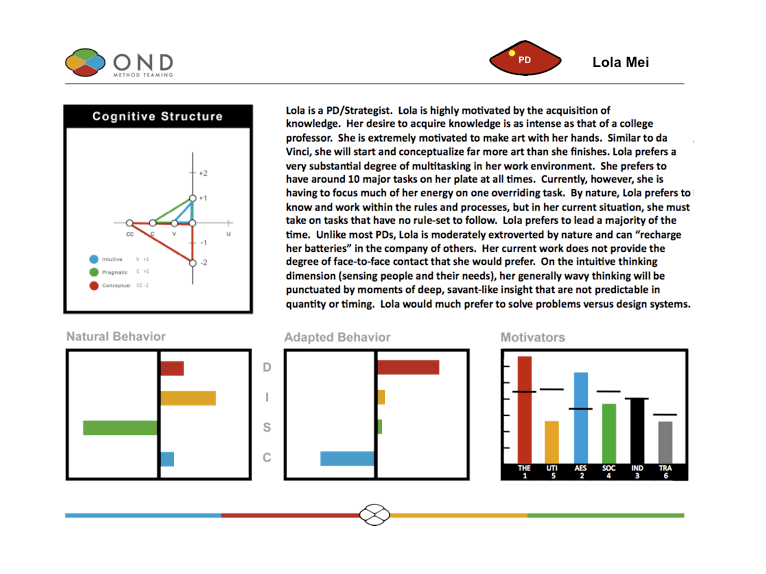 The 3 areas measured by the Instruments are Behaviour, Motivators and Cognitive Structure. The exponential effect of integrating the results of the three Instruments is that they actually impart not just three times the information contained in any one of them but more like seven times. The complex math and algorithms that describe this integration are the unique science of Method Teaming. With the integrated result from the three Instruments, Method Teaming is able to ‘vector’ a person’s Intellect with extreme accuracy. Each person’s MTIP profile is laid out on a single page and is drawn in such a way that their Intellect can be read like a map. Below is an example of a Method Teaming Intellect Profile. Most hiring and internal transfer decisions are made on the basis of learned skills. But a huge number of us – 80% according to the Deloitte Shift Index – loathe our jobs. Other research paints a similar picture. Clearly a skills match is not a satisfactory reference point for a career move or hire. But recruitment or team building decisions made with Method Teaming result in massive rises in employee engagement and retention ratings. Productivity leaps. Natural talents and attributes – our Intellects – are a more solid guide to team building and recruitment than skills and qualifications. Method Teaming science can also identify people playing out of position and in the wrong role for their natural strengths and talent in any organizational team. It can then fix the problem with a process that enables the selection of the right candidates. Method Teaming ensures you will always have the right talent aligned with the right task at the right time. See Talent Management Solutions >> Talent acquisition, employee engagement and human capital management are easier and more accurately achieved with Method Teaming. Bring Method Teaming science to your organization and realize significant productivity improvements across all your work teams. Call OND today.